Have you signed up for your chance to win over $50,000 in cash and prizes? September. The numbers of pinks will likely decrease as well as the majority of the run head up to Indian Arm. At Furry Creek some days the fishing is slower and the next day there is plenty of fish as waves of fish come through and move up the Squamish River. If the water clarity is poor due to wind or freshet then use a bigger pattern and it doesn’t have to be pink; chartreuse, blue and green are another favourite to catch pinks. If you want to try your luck with terminal tackle we have plenty of spoons and spinners for both coho and pinks. This is truly a great time of year to be a saltwater angler. There is so much to do in August you need to take a step back and choose where to fish and for what species. If you are heading out for a half day or for a local trip, look no further than Vancouver Harbour. 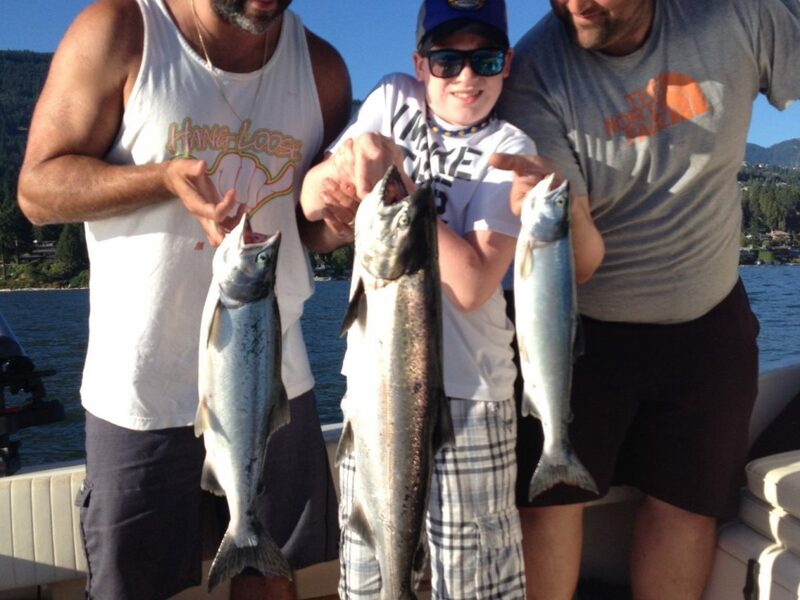 From Point Atkinson to the Cap Mouth there have been some great catches of pinks and coho all week long. The best action has been in the 20-60 range on the downriggers. 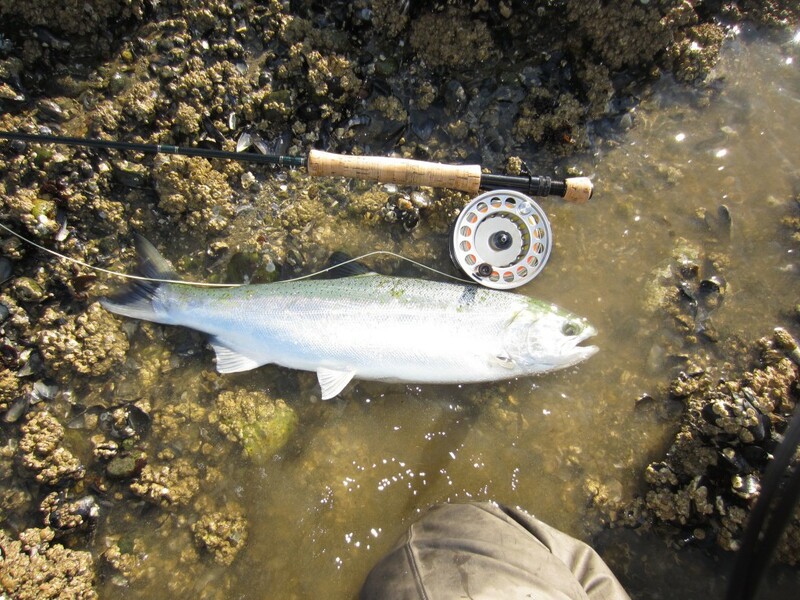 The white uv hootchies have continued to work well for coho, and also for pinks. Some smaller spoons are also working well for coho and some of the fish we cleaned this week had 2-3 inch herring in their stomachs, hence the success on the smaller spoons. 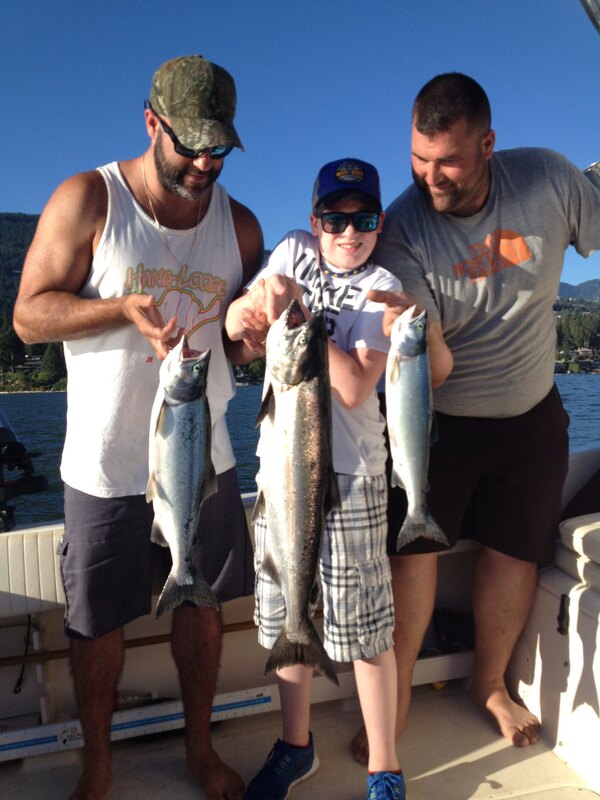 There are a lot of Fraser and Howe Sound pinks getting pushed into the harbour and they will bite the coho gear mentioned previously, but if you really want to get the rods bouncing, try putting on a pink hootchy, pink spoon or pink Apex. We have all of these items in stock and ready to go. For flashers we have been using some of our favourite go to flashers for fishing in shallower water, the Betsy, Green Onion, and Purple Onion. On the other side of the harbour, over at the Bell Buoy, there have been some chinook caught. The usual hot setup up of a chartreuse glow flasher, 6 foot leader to a glow green teaser head and anchovy, has been putting some nice fish in the boat. Hot depths at the Bell Buoy are from 40-80 on the downrigger. Chris, Kieran & Diego with a chinook landed this week with guide Eddie. 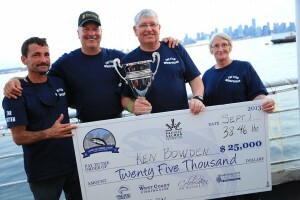 If you are looking to do some light tackle fishing or some fly fishing, try heading up Howe Sound. There are lots of pinks in the Sound and you will often see schools finning on the surface, especially from first light until around 10:00 am or so. All you have to do is cast a pink spoon, spinner, or buzz bomb and retrieve it in front of these fish and it can be a fish a cast. Spin casting is good, but fly fishing is often the most productive method as the fish love to smash small pink flies and sometimes the larger spinners and spoons are almost too much for them. A floating line or clear intermediate line is suffice in the morning, but once the fish go a little deeper you may need to use a fast sinking line. We have a good selection of pink lures in stock for this fishery as well as custom flies for the pinks and any fly lines you may need. We are also booking charters for this fishery, so if you are a fly fisherman and want to try this, I highly recommend it. Catching pinks in the open ocean on a fly is a lot of fun and the fight on a fly rod is great. Alex is back with the biggest fish on the boat! Speaking of pinks, the Fraser pinks will be showing up by the millions in the coming weeks. 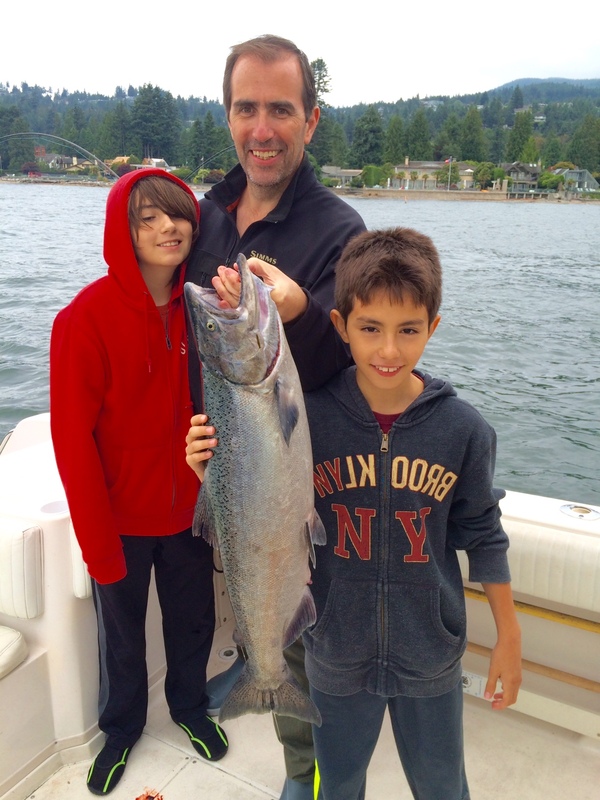 We are already catching them while fishing for chinook off the T-10 and South Arm. These pinks will hit anchovies while you are fishing for chinook and of course if you put a pink hootchy or spoon on you will really start to get some hot and heavy action. It is a good idea to have a light spinning rod rigged up with a pink buzz bomb or have your fly rod rigged up with a sinking line and bright pink fly. When a big pod of pinks cruises by it can make for some fun light tackle action if the chinooks aren’t around that day. To target the chinooks, and it has been well worth doing so this week; fish the N. Arm, T-10 and S. Arm areas. Fish in 120-250 feet of water and keep your gear relatively shallow as these fish are up high in the water column. Successful depths are generally in the 30-80 range on the downriggers. Bait is by far the top producer for these chinook and we like to run chartreuse glow flashers, 6 foot leaders, and anchovies or herring in glow green or glow green chartreuse teaser heads. This fishery is just getting going and peak migration occurs in the coming weeks, so if you want to target some of these big boys, now is the time. We have a few openings left for charters as well, so give us a call at 778-788-8582 and we can take you down to T-10 or the S. Arm to get you into some big chinook. If you want to head out on your own boat we have a large selection of the hot flashers, bulk teaser heads, and lots of bait and salt in stock.